What is the difference between Islamic Counselling/counsellor and a Muslim counsellor? An appreciation of similarities and differences in Islamic philosophies and Western Psychology. A general web search of services which offer Islamic counselling and training offers few. It is generally considered that Islamic counselling is still in early development with emerging academic research supporting its growth. Is there a standalone Islamic Counselling model purely based on Islamic teachings? For an answer to this we would be required to refer to the holy book the Qu’ran and the prophetic practices and teachings within the Hadiths. We find It is not clearly definable, there is no section titled ‘the Islamic counselling method’. So how do we define the process of teaching, training and practising as an Islamic Counsellor? Over the years I have grappled with the subject within academic research, in my personal development and my practice as a counsellor. You may have read my offerings on the subject over the years as I learn, adapt and change, sometimes within the pages of this website! 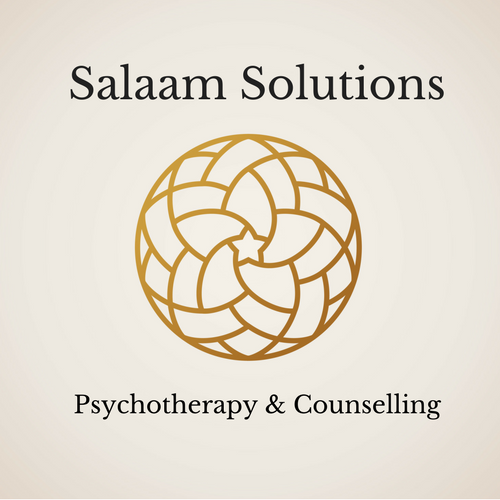 My intentions are to understand what an Islamic approach to counselling is, whilst attempting to offer empathy and shared experience with my Muslim clients. This attempt has morphed in to what I recently refer to as an ‘Islamic inspired approach to psychotherapy ‘. I’m however uncomfortable with the title and posed the question to my peers, ‘what does Islamic inspired say to you? Is it arrogant or presumptuous to even refer to Islam in my counselling practice? Does it convey me to be an expert, a pious individual, a knowledgeable source?’. I’m embarrassed at the thought, hence my attempt to understand possible accusations in order to fine tune my professional practice! So far in my journey, and this is by no means an answer, my personal explanation of use of the word ‘inspired’ is that the roots of my hopefully ethical, empathic practice aim to be sharia bound and my personal intention to practise as a counsellor is with God consciousness (let’s face it’s not money!). I’m not blind to the other reasons that can dirty my intentions, ego, fame, the rescuer in me, an ostentatious aim to save all! I aim to please Allah swt, but heck I’m not perfect! Is this far from any other approach to counselling, yes and no. I suppose the main difference for me is that autonomy (the aim in TA counselling) means ‘La illahha illallah’ (there is only One God, Allah). I project La illah ha illallah, it can’t be helped, I cover my hair, I say; ‘bismillah, subhanallah and allah akhbar ‘frequently. When with a non- Muslim I tone it down! But my beliefs are not hidden (I’ve tried, doesn’t work!) and if asked, are shared in an appropriate manner (mixed with a little paranoia!). If my professional codes of practice clashed with Islamic principles or Shariah law I would not register with that particular governing body, but the ITAA & BACP fits my ethical stance in basic human principles of care, so far I have not found a clash. The Islamic Inspired part, even if it is a play on words, could it lead a person to assume they are paying for an entirely Islamic service? Also ‘payment’ there rises another debate! Here’s what I do offer in an Islamic Inspired way: I do not usually open the therapy session by asking clients to join me for salah or dua, unless its time. I have made dua in sessions and have prayed with a client which I have to say was a truly special and spiritual experience that took the relationship to another level. I do not usually preach Qur’anic ayah to every client dilemma, however sometimes we will discuss ayah which sounds something like this; ‘ there’s an ayah relating to your situation, do you know the one? Uhhmm something like, oh I can’t remember! Hang on let’s find it (we can’t find it!) ok let’s ask a sheikh!’ . I do not advise sharia law but I remind if sharia law is lacking or being broken, which is rare and it is mostly the case that a client will usually start by saying ; ‘I know its haram but ….’. Ill admit there have been particular sharia laws that i struggle to understand, namely polygamy, but trying to hide the disgust on my face when a client sobs about her situation with a husband who demands another wife or who has married without permission, these incidents are difficult to grapple with, but we grapple and we laugh as do our eyes sting with tears. If there are grey areas none of us know, we consult a sheikh. When I think of how I would like to be counselled, how my perfect (or nearly) Islamic therapist would be, their character, their manners, their words, their care for my situation, I would think of the Prophet swws. To qualify to this level is high attainment for us lowly people, to emulate or aim to follow in the footsteps of such an inspirational being would require a person to have most if not all of the 77 branches of faith. Such status and attributes in a person would require one to have thorough knowledge of the Quran and action of the Quranic and Sunnah in all aspects of one’s life. The closest I consider to be an ‘Islamic counsellor’ would be an Alim, a scholar and a specialist in say Tarbiyah and Tazkiyah (purification of the heart) one that is and raises others to be the best they can be both spiritually , psychologically, in manners and in knowledge and wisdom (where are they?). Every counsellor who has a weight of good in them knows that one must work on their own self and understand their own process before they can be of help to others. Personal therapy is essential part of the training process, without self-accountability and a mirror into our own dark side we would be lying to ourselves. Therefore my mirror tells me to just aim to be a Muslim, aim to be a Counsellor and aim to understand Islam. That’s the safest way. Previous:Have you been effected by Ruqya?